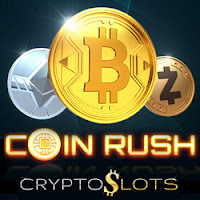 Gleaming Bitcoins, Monero and Litecoins spin on the reels of CryptoSlots.com's new game, Coin Rush, and its free spins feature can mean mega-payouts to players' cryptocurrency wallets. From September 26 until October 1, Cryptoslots is adding up to 50% to your deposits. At Cryptoslots, deposits are made in cryptocurrency and automatically converted to US dollars for game play. Cryptocurrency is ideal for online casino players. Deposits and withdrawals are easy and safe and transaction fees are low. Sign-up at CryptoSlots.com is simple and requires only an email address. Scatters can trigger free spins. Before the bonus spins begin, there's a "pick" game where you choose a coin to increase your number of free spins. During the bonus rounds, any extra Scatters increase the free spins, up to a grand total of 99x. The win multiplier increases -- up to 5X -- with each free spin win. CryptoSlots.com recently added Jacks or Better Multi-Hand video poker game to its video poker menu. The popular new crypto-casino now has 16 provably fair slots (five with high limit versions), six video poker games and one million-dollar jackpot game. They can all be played on any computer, smartphone or tablet.